Those were the halcyon days - Egypt after the Suez crisis. My American friend, studying Oriental languages, and I shared a flat serviced by a Sudanese fellow called Mohammed, who could make the most marvellous breakfast which was desperately needed after an all-night session editing the flowery language of translators at the Egyptian Gazette. Up above us were two genteel English ladies out of the Trollope generation, their rouge wilting under the furnace of a hot Cairo summer, a legacy of who-knows-what war or expedition. Washed upon the shores of the Nile, these two old charmers from another age had found their home in a far-off land and through the vicissitudes of, first, a very attractive colonial existence and then the political upheavals associated with the rule of Gamel Abdul Nasser had survived in the somewhat seedy glory of Tahrir Square. They would never leave, although their material means were gradually leaving them. Awaiting them, as with one of my friends who had married an Egyptian girl during World War II and then died suddenly, was an incredibly fast burial, because of the heat, in the desert sand of their adopted land. 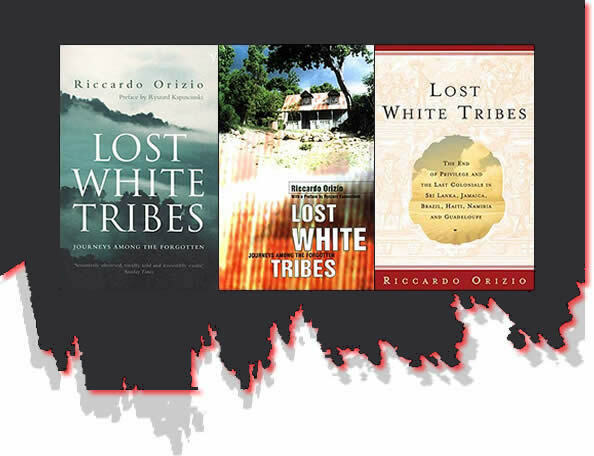 You will find such people in all the outposts of Empire and, while my recollections are of individuals stranded or choosing to live far from their homeland, Riccardo Orizio, an Italian correspondent, has taken us into a similar world of white tribes lost in a sea of native jurisdiction. 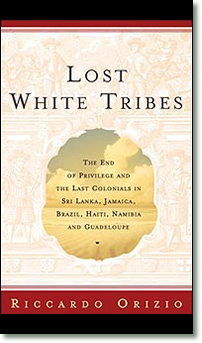 This is a brave and imaginative odyssey, certainly a familiar road to anyone who lives in the nostalgic world of the past, spotlighted in "Lost White Tribes," by a tribe of the Great Trek living in Reheboth in Namibia, yet also encompassing Asia, the Caribbean and South America. The author, perhaps rightly, calls them historical fossils. It all comes down to the sins of the fathers, for the tribes are descendants of different generations of colonizers, and Mr. Orizio's probing text, exotic as the settings, embraces a global swathe of outlandish history. The Dutch Burghers of Sri Lanka are the classic, living in grand crumbling mansions, as if this was still the 18th century, according to one Sinhalese friend of Mr. Orizio's. Many were poor - "too white for some, too native for others" - and walking a thin line between privilege and discrimination. Their forefathers would have sailed east, aboard Dutch East Indiamen, in the 17th and 18th centuries, to a world of supremacy based on land and fine houses. Independence has swept all this aside and, as their forefathers were adventurers and sometimes rebels, so today their descendants have become outcasts who have not the cash to return to their original European homeland or the courage to abandon their old way of life. Perhaps the most astonishing lost tribe is that of the Confederados, who after the Civil War left for Brazil in "self-inflicted exile," refusing to live under those "damned Yankees." There is a touch of "Gone With The Wind" defiance in their heritage and some hints of frowned-upon native intermarriage. Still they hold a victory celebration once a year in the streets of Santa Barbara, donning the uniform of the Confederate army in the presence of a solemn Gen. Robert E. Lee. Such a carnival, almost eccentric, atmosphere pervades life throughout Mr. Orizio's way-out book, which is a social documentary in itself. None more so than in the sad case of the Polish descendants living in Haiti, the down-the-line offspring of Napoleonic soldiers sent to quell a slave uprising in exchange for the illusory liberation of their homeland from Prussian rule. They are looking forlornly to the Pope to rescue them from their poverty, feeling that his visit in 1983 when he kissed the ground of their land was filled with patriotic meaning. Meanwhile, the Basters of Namibia commute us back to the ox-wagons of Calvinist farmers, their "Hottentot women clad in the lace-trimmed costumes of old Flemish painters." In a sense they are also Dutch Burghers, for their ancestors came out of the Cape fleeing reformist British rule, and somehow they landed up in the "promised land" among the Ovambo, fighting wars throughout their history. The new government has not taken kindly to them, seeking to confiscate thousands of acres of their land, a vast wilderness covered in termite hills "like Gothic cathedrals." By all accounts their settlement of Reheboth (from the book of Genesis), with a street named after Hermann Goering's governor father, is a last-stand stronghold and John Gunther calls its white inhabitants Afrikaners of the poorest type. The question of poverty and disease invests all of Mr. Orizio's stories of communities left to die. The demise of some is nearly imminent - particularly the Blancs Matignon of Guadeloupe, descendants of a French group of colonists, who were aristocrats fleeing the guillotine or small-time slave owning farmers clinging to traditional life. Inbreeding to the extent that almost all of the community is "a cousin if not a brother," leading to an intermingling with non-whites in search of fresh blood, is having a backlash on this tight fraternity. While they claim French kings within their history, they are merely scraping out an existence. Still, in future history there will appear the blue eyes of the past, as I experienced in meeting "Colored" descendants of Norwegian whalers on the South African coast and, as Mr. Orizio points out, you may still find a white-skinned tribe of Greek origin in Afghanistan after the long-ago expeditions of Alexander the Great. The book has one more story to tell - of the Germans in Jamaica, descendants of 18th-century colonists. When the movie "Papillon" was filmed in Seaford Town, there was no problem finding actors who could become prisoners. "The had only to play themselves," writes Mr. Orizio. "They too were prisoners, prisoners of the tropics, their bodies sculpted by disease and overwork, their eyes haunted with the sad expression of those who have lived too long away from home." Burgher expressed, the strangers in their own land. My own personal experience of "poor whites" was the Portuguese exodus from Mozambique and Angola in the time of the Rhodesian war. They were forced to build new communities, foresaking their family treasures built up over centuries. One of them was a beautiful girl dressed right out of the colonial era. She spoke no English but danced divinely, watched by her eagle-eyed mother. The Portuguese enclave would survive in Africa - and this girl, whirling in a carousel, would surely become the matriarch of a new lost tribe.